A new report on Ontario's daily electricity sector demonstrates the shortcoming of reporting of the sector's costs that contributes to the poverty of intellect in much too common communication on the sector. The new report is from me, and it is to provide consumers, and other critics, with a more intelligent summary than the little noticed "Daily Market Summary" produced by the province's system operator (IESO). I hope some readers will work through the additional numbers as they can demonstrate the broad themes driving pricing in Ontario - and if some that do the work join a chorus calling for some transparency and meaningful reporting from the IESO, my work in creating the reporting will be somewhat justified. 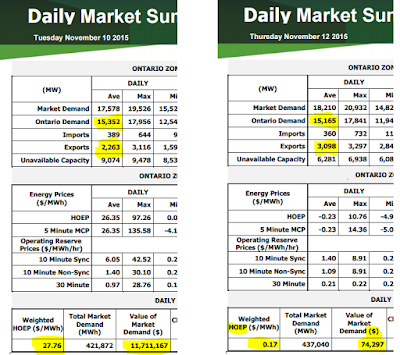 If one were to have no other information than the IESO Daily Market Summary reports for November 10th, and 12th, they'd think a little less demand - 187 megawatt-hours (MWh) - resulted in the price dropping $27.59/MWh to essentially free. Ontario's demand for electricity did not change. The IESO's "demand" is not Ontario's consumption, but the demand for supply from generators in the IESO's market. There are qualitative issues with the IESO report. The HOEP price is the Hourly Ontario Energy Price. 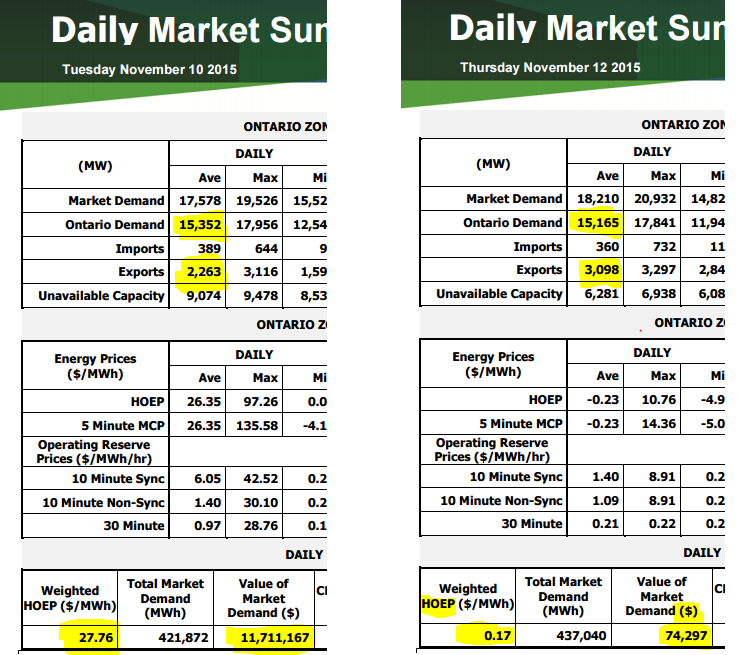 The weighted average is arrived at using hourly "Ontario Demand" and hourly HOEP - if one wanted to competently establish the "Value of Market Demand" they would not do it as the IESO does in this report. The weighted average price of exports has always been different, but since the IESO prohibited negative-priced exports the difference can be enormous. My daily report includes cost estimates for all generation: IESO participants big and small, the rapidly growing category of generators embedded in distribution territories, and curtailed supply. The Global Adjustment component that will be added to bills in Ontario is the difference between the cost of supply and the market value of that supply. That's a simple demonstration of what the bulk of the global adjustment essentially is - ignoring the IESO's experiments with things like conservation and funds and financing. When the global adjustment is allotted to consumption, by breaking it down to a charge per megawatt-hour (MWh), it distorts the distribution of overall supply costs very significantly. On the 10th Class B consumers, which should equate to residential consumers , would pay $94/MWh (9.4 cents per kilowatt-hour), while the average for all consumption was $77. The disproportionate growth in the rates most pay for powers due to this windy day supports the premise of a controversial paper released last year by Ross McKitrick and Tom Adams. Many struggled with the presentation of data suggesting wind contracts were driving up rates by more than the cost of procuring the wind supply. A difficulty in explaining correlation to be indicative of causation is that the explanation may be complex. Perhaps the disproportionate impact on end pricing of increasing supply from intermittent sources would best be demonstrated by comparing days like November 10th and 12th, where we see the drop in the HOEP as supply increases results in less money from exports, and less so from large Class A consumers, leading to most Ontarians paying $118/MWh for the same supply as exporters pay $1. An addendum, of sorts, is now posted on my tumblr site. The most expensive day for the typical Ontario electricity consumer looks at selected high, and low, cost days for class B ratepayers. I intend on posting reports for more days in this shared folder, although posting will be very intermittent in keeping with the personality of Ontario's electricity sector trends. If there's a day of particular interest to you just let me know in an e-mail, or the comments below, and I'll generate a .pdf of the daily report. 1. All figures are estimates arrived at through various methodologies. While I'll show estimated curtailment of "Gas" and "Hydro", I do not attach dollar values to either. The "gas" curtailment is NUG's, and I can't be certain contracts don't allow for the system operator to schedule the outage (generally theses curtailments will occur over days, on weekends). The hydro curtailments here refer to generation from Saunders and Chats Falls that I see as being fed directly into Hydro Quebec's grid. This is perfectly sane and there is likely a reciprocal arrangement - or HQ may be entitled to some output. The IESO's infrequent showings of summary values for curtailed power include curtailed imports (which I don't have information) on. Ontario Power Generation includes figures on curtailment in their financial report - these numbers are far greater than my estimates because I don't estimate any curtailment aside from what I can with confidence see (which is the direction of power to HQ). 2. You ask the IESO what funds and financing is. I have no idea. 3. Residential, and small business consumers, are billed at set regulated price plan rates, but those rates are essentially set to recover the anticipated "Class B" rates for the coming period.